Sheriff Keith Slape said that a search warrant was executed at the Jesse Brock residence in western Newton County on 12-3-12. 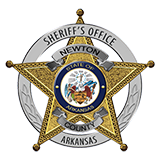 Newton County Officers along with 14th Judicial Drug Task Force found components for a clandestine methamphetamine lab and drug paraphernalia in the residence. Brock, 30, of Kingston was charged with Manufacture of Methamphetamine, Possession of paraphernalia with intent to manufacture methamphetamine and Possession of drug paraphernalia.